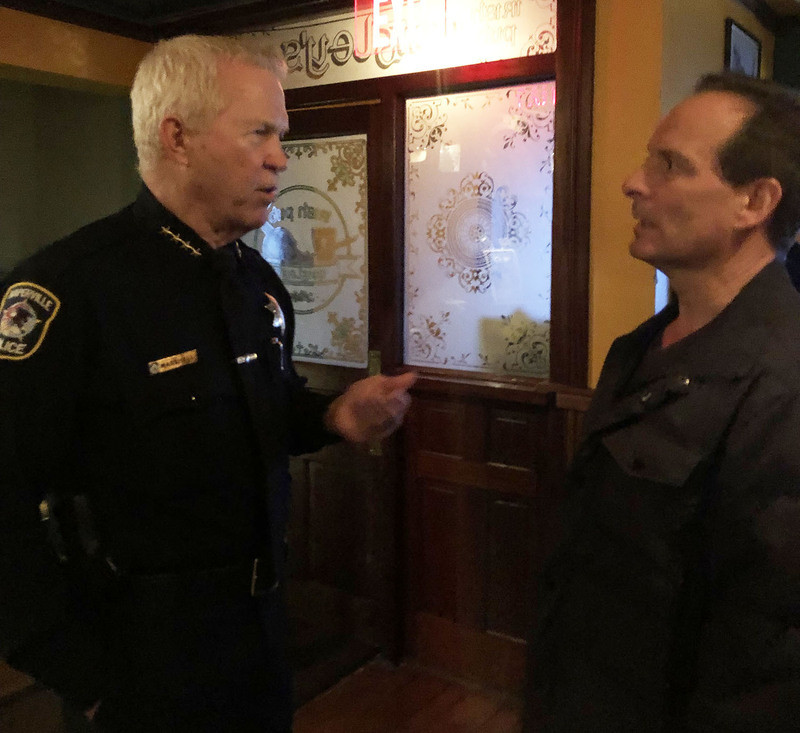 Naperville Police Chief Robert Marshall strolled among tables at Quigley’s Irish Pub in downtown Naperville recently, stopping to greet young families on hand for an early dinner and adults seated at the large mahogany bar. Marshall was there along with several other Naperville police officers as part of an informal meet and greet dubbed “Chat with the Chief.” It’s a quarterly event held at locations around town, ranging from coffee shops and restaurants to North Central College. Although the location changes, the objective has remained the same: give residents an opportunity to discuss issues and concerns, share complaints, and even throw in a compliment or two to Naperville police. Tony Andrews came to the event to express his gratitude to the officers, particularly those associated with a recent in a recent officer-involved shooting. Andrews had viewed a video dashcam of the incident which was posted to the Naperville Police Department Facebook page. Naperville’s Jim and Nancy Laures came armed with specific questions relating to a hit-and-run accident that occurred while their vehicle was parked on a side street. “We were told about the process and got our questions answered. It was very helpful,” Jim Laures said. Marshall said he hears concerns about traffic congestion issues, enforcement of traffic-related issues such as speeding and stop signs and the enforcement of overnight parking. As a result of resident concerns, Naperville Police added a community service officer to enforce overnight parking . He also said residents have come to the event asking for more police presence in their neighborhoods. Marshall also said he is often asked about issues that are “happening all around the country” relating to school safety, the opioid crisis, teen suicides and the increase in calls related to mental health. “We also get individuals who come and ask questions about a career in law enforcement,” said Naperville Police Deputy Chief Jason Arres. Austin Gianino, a Fisher Middle School 7th grader, came to the event with his mom, Lisa Gianino, to work on a Boy Scout merit badge. The two discussed intervention programs and where old prescription drugs can be disposed of within the city limits. Gianino said initially he was a bit apprehensive to ask the police officer questions. But Arres was very friendly and gave insight into how he got into law enforcement. Arres also reiterated the importance of “see something, say something,” Austin’s mom, Lisa Gianino said. “I don’t think you can go wrong with that motto,” she added.